The hippopotamus is common throughout the waterways of the African continent. The Hippopotamus, or hippo for short, is one of the largest land mammals in the world. They are a dark purple-like color and have a very stocky build, with their huge torso’s rested on top of 4 short yet strong and thick legs. They have very strong and large jaws which they sometimes open wide in an attempt to show off. Males and females look almost identical with the main differences the size of their teeth and their overall size. Males reach sizes of an average of 1500kg (3300lb) and around 1300kg (2900lb) among females of the species, with some of the largest individuals recorded weighing nearly double that. Hippos are found widely throughout Africa, but are typically confined to areas near a perennial water source in which to live. They are found in areas of South Africa near rivers, particularly near the Limpopo, along with parts of Mozambique, Zambia, Zimbabwe, Tanzania, Kenya, The DRC and other equatorial countries along with the southern parts of West Africa’s horn. 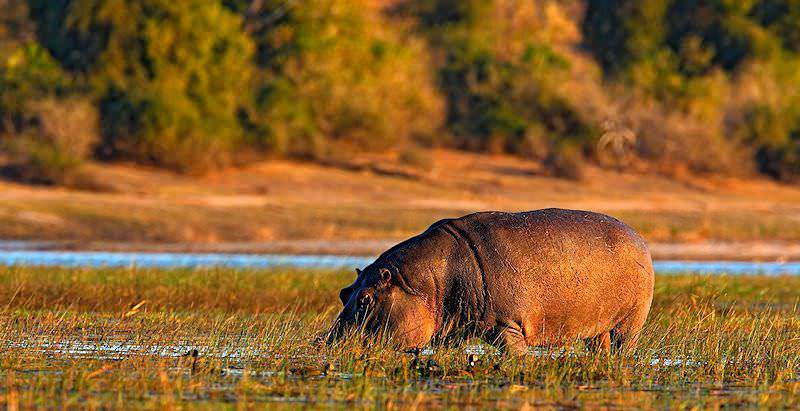 Namibia has a low hippo total mainly due to its dry nature, but parts of Botswana thrive with live in the water, particularly seasonally in deltas and marshes. On the coast between Namibia and South Africa hippos are however found in the shallows of the ocean near the beach, the only place where this occurs. Hippos, like many water dependent animals, have suffered great losses as a species over the past few decades, with these same declines expected to persist in the near future, leading to their status as being vulnerable. Continued habitat loss has posed the greatest threat to their existence and has greatly cut down their populations in countries they previously thrived in, with some 7 – 20% declines reported, although their current population of 125 000 to 148 000 on estimate seems a lot. The Kruger National Park is one of the sanctuaries in which hippos are found in a safe environment fit for them to keep up a stable rather than declining population trend. Hippos aren’t very high maintenance, but do require a few things to make a habitat work for them, a water source in which they can completely emerge, preferably year round, along with a nearby grassland or woodland in which to graze upon grass. They are so dependent on water because of their skin which naturally dehydrates quickly and rapidly, even more so on hotter African days. They only come out of this water and into the open during the night, when they walk to feeding grounds. This walk is up to a few kilometers for some populations in areas where grasslands aren’t found close to water sources like river or lakes. Hippo’s are not territorial animals, with dominance hierarchies based on size determining who gets mates during that time of the year. Hippos, otherwise, form groups of a few individuals who all inhabit the same water source by day, but scatter themselves during the evening when they go to forage or graze alone under the moonlight, not worrying about their safety or security when predators come their way like other grazers. They tolerate the presence of other creatures of the water, but do not respond with the same calmness when their spot away from the sun is threatened. In a fully flourishing and vibrant hippo community there are a number of everyday signs or sounds they use to portray certain messages. Dominance displays for example include yawning, which shows off their magnificent tusks to their attackers, intimidating or striking fear into the mind of any unworthy opponent. The same displays are shown when two males of this species settle a quarrel over a possible mate, with the loser swimming away with an injury of some sort more often than not. This behavior peaks during mating times when a female goes into heat, creating a mating opportunity. Hippos generally mate around the driest times of the year, causing most births to occur during the rainy or wet season of the year when offspring have the greatest chance at survival. This birth comes after an 8 month long gestation period from the point at which the female conceives. She can only start this process that ends with these beautiful young offspring around the age of 9 years when she matures sexually. Males will know whether a female is in heat by carefully walking around the back of each female in their close vicinity to smell their behind. Mothers can have new young every 2 years or so. Hippos are fairly immune to predation for the most part, not easily being rattled by even the largest animals. Their very cute, but also quite large and robust young are however much more vulnerable in this regard, and often need protection from large plain predators; namely lions and spotted hyenas. For this reason mothers have on high alert when going out to graze with their young at night. Mothers are perfectly capable of protecting their young and even killing their attackers in the process, with jaws and a bite force able to pierce a crocodile in half. Botswana travel is characterized by eco-friendly safaris. Namibia's most popular destinations are Etosha National Park and Sossusvlei. Mozambique is revered for its tropical splendor and 1000km of beaches. The Kruger National Park is revered for its extraordinary diversity, from its 147 species of mammals to its range of unique eco-systems. The Sabi Sand Private Game Reserve is famous for the incredibly high frequency of leopard sightings that occur within it. Cape Town is a captivating city the abounds with opportunities for adventure, from shark cage diving to climbing Table Mountain. The Garden Route is an enchanting region in South Africa's Southern Cape, blessed with remarkable natural beauty.